Welcome to Pinetum Christmas Trees! 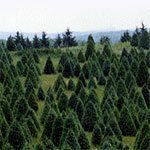 Marshall Stacy has been a full-time Christmas tree grower since 1970. He and his wife, Cindy, own and operate a 370-acre tree plantation in western Maryland’s Garrett County, named Pinetum (the name means an arboretum of evergreens). The couple has two grown children, who live in Baltimore and Glenwood, Md. Over the past 49 years, Marshall has wholesaled and retailed quality “living room” sized Christmas trees, but in recent years, Pinetum has become one of the leading farms to sell large, sheared Christmas trees, up to 40-feet tall. Each holiday season, more and more special-order Pinetum trees decorate locations up and down the East Coast and occasionally abroad. Beautiful, extra large cut Christmas trees have graced places like Miami’s Miccosoukee Resort, the Hilton Hotel in Seoul, Korea, Fort Worth, Texas and the famous Longwood Gardens near Wilmington, Delaware. On occasion, large, balled and burlapped trees grown on Pinetum have been dug up and transplanted to become permanent Christmas trees elsewhere. One such tree, a 42-foot, 15-ton Douglas fir was successfully removed in November 2003 to a shopping mall in St. Louis, Mo. Marshall’s many innovations in tree farm management and production have earned him recognition and awards. He was named Mid-Atlantic tree farmer in 1986, beating out 4460 tree farms for the honor. His ideas on managed forestry have appeared in stories in The Washington Post, The Sun and national television. Among a handful of Marylanders chosen to articulate their “hope and dreams” for special millennium Sun coverage, Marshall was featured – in a brief profile with a color photo – as a tree farmer wishing, “there were some way science could replace politics,” as it applies to correctly managing Maryland’s forestland. A member of the Maryland Christmas Tree Association, Marshall has long volunteered his time to advance the cause of sound forest and wildlife management in Maryland. He served on the 1990 Governor’s Task Force on Trees and Forests and the first Garrett County Bear Task Force. He holds a B.S. degree in business from the University of Maryland, College Park, where he also studied horticulture and worked for years on a special committee that ultimately secured funding for a new Plant Sciences building on the College Park campus.